Many of our users have noticed data issues over the past several weeks that have resulted in a number of issues ranging from seeing their tiers drop suddenly to receiving messages to reconnect their utility accounts. We have seen that users who try to reconnect get an error page like the image shown below. The issue stems from site changes THESL implemented, which broke Green Button Data access. The Green Button initiative is an industry-led effort to provide utility customers with easy and secure access to their energy usage information in a consumer-friendly and computer-friendly format. Customers are able to securely download their own detailed energy usage with a simple click of a literal "Green Button" on electric utilities' websites. OhmConnect relies on this Green Button Data to calculate how much energy our users used during their OhmHours. Currently when you click on THESL's Green Button the information that is returned is missing meter data. Why is it taking so long to fix? 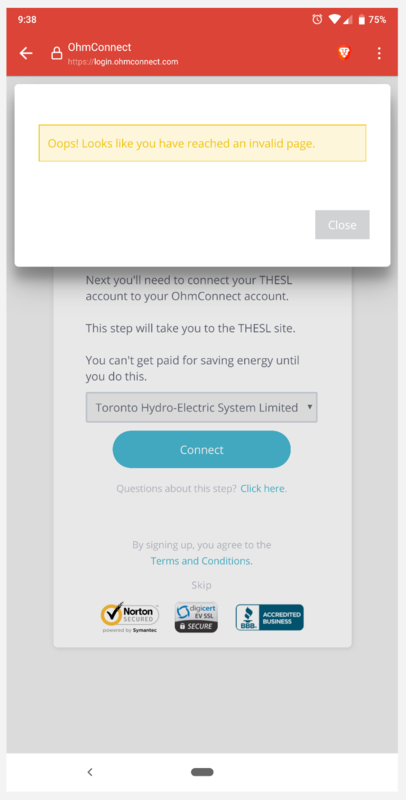 THESL is not an official Utility partner with our platform. Unlike our other partners, we do not have a contact inside THESL who can work with us in fixing data issues. Typically, official cooperation with Utilities allows us to receive user data in an effortless, automated manner. When this process breaks down, partnerships with Utilities allow us to arrive at a fix quickly. This is not the case with THESL. Quite simply, call THESL support and let them know they are no longer compliant with the Green Button Initiative. So far, a number of our users have called in and it seems to help keep the issue on THESL's radar as they have mentioned a ticket being opened for the issue. Hours = Monday - Friday, 8 a.m. to 8 p.m. When we have data restored from THESL we will run re-calculations on our THESL users and make sure that any OhmHour participation is properly credited. We will send out an email to all our THESL users after the issue has been resolved. If you see a persistent negative impact after a solution has been implemented, we will correct these errors immediately as you let us know.